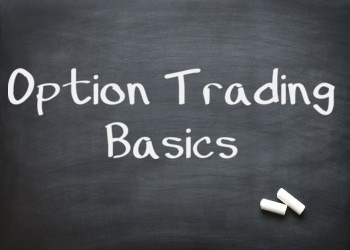 During this most recent market pullback, I've been getting a ton of interest about an options-related indicator that I use to help my market timing. In this post, you'll see how to construct this indicator, why it works, and the trades to consider to take. The VIX is a 30 day reading of the implied volatility on the SPX options board. Basically, it's a way to measure the demand for options. And most of the time, the demand for options is when volatility picks up. And most of the time, volatility picks up when stocks are selling off. That's because the demand for liquidity is different when people are being forced to sell compared to when they are being forced to buy. If you've had any experience with the VIX, you know that high VIX readings can signal a "panic" and mean that the market is ready for a turn back to the upside. But sometimes the VIX can be fickle, and it doesn't properly show us how panicky it is on the short term. The VXV is a 90-day reading of the implied volatility on the SPX options board. Because this is a longer duration, the options tend to be less sensitive to the "near term" issues affecting the market. And if there aren't many near term market risks, then the VXV will trade at a premium to VIX because we are much more uncertain what will happen 3 months out compared to one month out. I call this the "just around the corner" trade where nobody thinks the market will selloff, but something is just around the corner so investors will buy longer dated options and sell near term options. If there is a clear and present danger to stocks, then investors start to get scared. And because the risk is so close and they are so scared, they start buying shorter term protection via SPX puts, SPY puts, VX futures, VIX calls, or some other instrument that would eventually effect the VIX. You can also have investors buying protection on individual stocks like XOM and GS, and the market makers will eventually arbitrage the volatility out. If the short term fear gets high enough, we will see the value of the VIX become larger than the value of the VXV. Technically, you could see a similar relationship when the VX futures curve goes into backwardation -- where the near term VX future is at a higher price than long term. 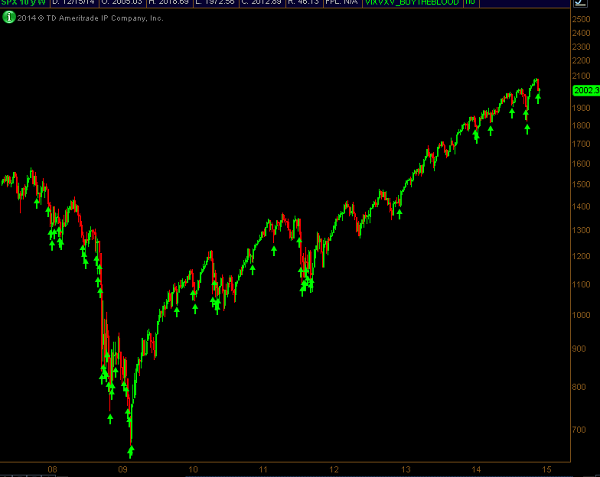 But using the VIX/VXV will give you the ability to chart this a little quicker. Panicky markets tend to also be right around where they bottom. 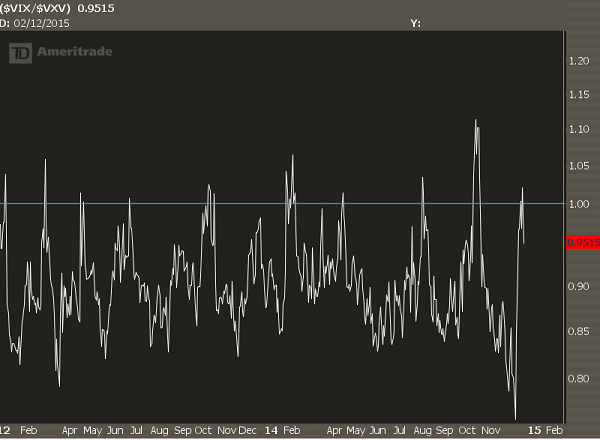 That means when the VIX/VXV goes above 1, you should be looking for new swing lows to be put into place. What you'll see here is that this signal did come through during the 2008 crash and had you bought the S&P off of this signal, you would not have done well. That's because, like many other oversold signals, they should be taken in the context of the trend. If the market is in a downtrend, then oversold can become much more oversold. Don't chase holy grails, and have some nuance in your market analysis. Since the market started its new cyclical bull market in 2009, the signal has performed exceptionally well. This indicator doesn't flash very often. It's only when we have market driving event risk (debt ceiling, QE fallout, Eurozone crises) that this will show up. This is not meant to be a super short term timing indicator with a ton of entries and exits. It tends to be a bit early. When we see panicky markets it's often justified in the near term as we see high actual market volatility both to the upside and downside. As time goes on and sellers run out, that's when the market will bounce. It is a high odds signal, but when you're wrong you are wrong big. A great example of when this signal fails was the summer of 2011 when the S&P downgraded the US credit rating. That means this signal is not meant for you to go 100% long stocks, but it fits better in the context of option traders that like to sell premium and can aggressively manage risk. This signal is not meant to be a "BUY EVERYTHING" kind of setup. When you see this signal show up, it should perk your ears up and you should start looking for dip buys that you have been avoiding. And if you had put on some market hedges or shorts, this signal provides you key market levels to define stops or adjust your hedging positions. Short the VXX. This is a volatiltiy ETP that does quite well when near term volatility is running hot, but it is not a condition that persists forever. 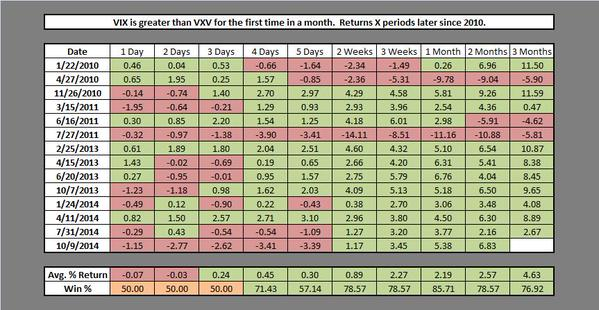 A good risk structure for shorting the VXX here is 3 month duration puts, or out of the money put calendars. Relative Strength Bull Put Spreads. Find the names that haven't been following the broad based market selling and start selling premium in those names. You could try and nail the bottom on stocks that are extremely oversold, but I've found it's easier to preserve psychological and financial capital if you stick with stocks still in uptrends. 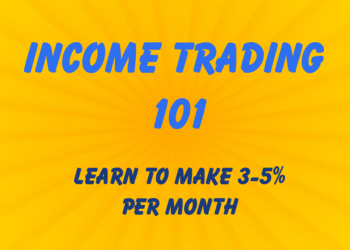 Reversion income trades. This strategy set uses fixed risk trades like butterflies and calendars on broad based market etfs that look for reversion back to the mean. This generally means that stocks are going to pop, bonds (TLT) are going to drop, and near term volatility is going to get hit. That last point is the most important-- if you are a net seller of shorter duration options and volatility gets crushed as a market moving event passes, then you stand to profit nicely. At the time of this writing, we are seeing these conditions present themselves, and I've been sending out trade alerts on all 3 of those strategies. 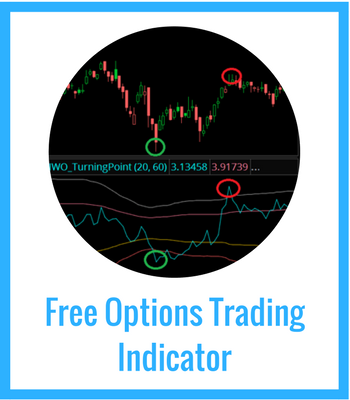 If you want to become a great options trader, then start a trial of IWO Premium today. Click here to learn more.